The textrade mattresses have received umpteen number of positive responses across various review sites on internet. A good sleep is required for a sound mind and body the next day. For a good sleep you need to make sure that you have good ambiance and environment in the bedroom where you sleep. There are a lot of things which count to make a good sleeping environment. A right temperature, good ventilation, a dark ambiance are only a few of the factors. What matters more is the mattress. 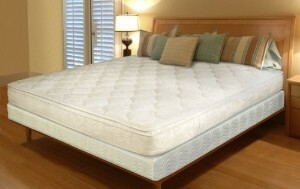 We can’t stress enough on the quality of mattress you must have to have a good quality sleep. Despite the advancement in the bedding solutions, there are a lot of reasons why can go for the traditional innerspring mattresses. Better yet, why go for the Textrade mattresses? Mainly because these guys know the stuff. They have been manufacturing the innerpsring mattresses since a long time, and definitely have got the nack to do it. The textrade mattresses have received umpteen number of positive responses across various review sites on internet. There is no reason why you shouldn’t. Talking of the specifications of the mattress, you can buy the textrade mattress in any size among the twin, queen, full and king. With the standard textrade innerspring mattress measuring a length of 80″ and a width of 70″ whose height measures around 11″. The best part of this mattress is in its core. At its core are the 1000 spring coils which are placed evenly which take up the entire weight of any one who sleeps on it. In order to make sure that there is no motion transfer; 15 gauge steel is used as base material for the spring coils and the perimeter of the spring coils are bordered too for the same purpose. Along with the mattress you are blessed with the pillows too. These too happen to be spring based with 2.5″ springs embedded inside them. These spring are supported by a thick layer of Denier foam. If cleaning and maintaining these is an issue for you; then worry not as you are also getting pillow covers manufactured with the Damaskan fabric as a base material. Now we talk about the packing. First thing is; you can be at peace when it comes to shipping and delivery. The company takes complete care of this task. The mattress is packed inside double plastic bags after removing the air. Then this bag is compressed and put inside the box. A set of wheel then carries this entire box; and this entire setup reaches your doorstep and from there you can carry it anywhere you want. Because of this; there is least to no damage to the cargo during the transit. Once the package reaches you; you will have access to the instruction manual which will guide you through the ‘to-do’ that needs to be done to the bed for the first few days. Usually the bed has to be put outside as you’d have to give it at least a day or two recover to its initial size and shape. During this time it’d be great if you could prevent your children jumping on it.